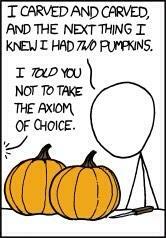 Find out who among us believe and who do not believe in the Axiom of Choice. Talk with your fellow math warrior about some examples of equivalence relations. Eat some pizza and just listen to the conversation next to you about the Continuum Hypothesis. Yes, I did say pizza. There will be pizza, snacks, coffee, and other refreshments. So, come by and enjoy the math! We are a club at the University of Hawaii at Manoa focused on helping math majors succeed academically, helping math majors to choose careers, and building a sense of community in the math department.